Before you get started on Facebook, you need a plan. Far too often, I see brands aimlessly posting on their Page with no clear purpose or direction. The approach is often self-serving. Hollow. Inconsistent. The result should be no surprise. It’s impossible to gain any traction, and the Fans you do get are uninterested and don’t engage. 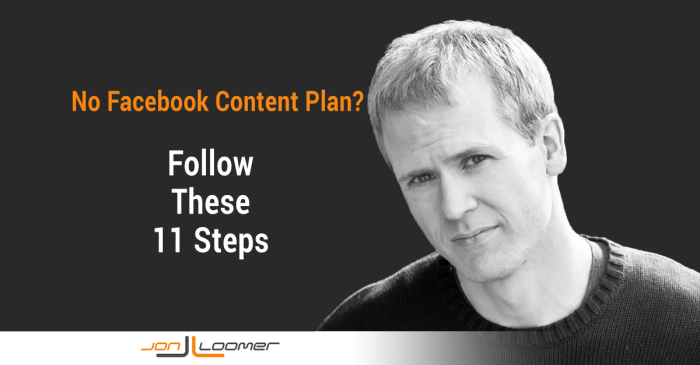 So how do you assemble the ultimate Facebook Content Plan? Well, it’s time to reveal my secrets. You start here. Not the goals of your Page. Not about how you need to drive X leads or convert Y sales. If your focus starts there, you will fail. Start drawing a picture of what this person looks like. Construct a story so that you understand their point of view. This is your target audience. This is the person who will be the source of your inspiration. Okay, now let’s get into your goals. The reason this is second is because I want that ideal customer to color what you do here. If you start with this step, you are going to be focused on money and metrics only. Don’t think only about numbers. Attempt to visualize how you want your Page to look in one year. How do your customers perceive it? How many Fans are there? What drives the conversation? Consider your competitor with the greatest presence on Facebook. What are they doing right? What are they doing wrong? What could you emulate it or improve upon it? Now consider what you want to get out of using Facebook. What is the end game? Is it brand awareness? Customer service? Nurturing raving and loyal fans? Now you can start thinking about the stats. But you first have to consider the environment that would get you there. Are you looking to sell product? How much? How often? Are you looking to generate leads? How will you do it? How many per month? Are you looking to drive traffic to your website? What kind of impact? Be realistic here. Make direct revenue the final goal. Start with where you want to be in one year, and then work your way back. First of all, scrap the PR and marketing voice. It doesn’t work. You’ll want to be human. But what does that mean? Once again, this will be related to your target audience. What appeals to college kids won’t necessarily appeal to seniors (obviously). That doesn’t just mean the content you share, but how you share it. Think through how it is you will present yourself. Start by writing a one page introduction of your brand to your Fans. You’ll never share or publish it. But it will give you practice. Do you have a photographer? A graphic designer? A videographer? A programmer? What partners do you have who could contribute? These are all important factors to consider when putting together your content strategy. Make a list of these resources, and within those lists create sub-lists of content ideas that they could create that would appeal to your target audience. Now make a list of all of your assets that can be used as inspiration for content. That includes things that already exist like articles from your website, articles by others, photos, videos, products and sales. Again, don’t think about this from a marketing and sales perspective, but from one of providing value. What will your ideal customer like? Once you have this master list, start breaking it up into categories. We’ll get back to this. Very similar to number five, but different. When thinking about your assets, I want you to assemble a list of types of content. For value, this is an opportunity to think about creative ways to make your Page interesting. Understand that your typical Fan will have a News Feed that is flooded with posts from 500 other friends and Pages. You need to stand out. Will you provide discounts? Run contests? Or will you teach something and make your Fans’ lives easier? Once again, make a list of the various things that you can do and break them into categories. Do not skimp on this step! If it’s too difficult to come up with value, you will not create a Page worth following. How many people will be managing social media? Is it just you? A team of five? How will they work together? What will everyone’s roles be? Who will be in charge? This is critical, particularly when it comes to consistency and voice. Sometimes, it’s better to have one person write the updates, but have a team that helps with creating the content. Do you have only one person managing the Page with an hour available per day? The content strategy you assemble will be different than if you have three people and 10 hours per day. Be honest with yourself from the start. Do not overcommit! Find the main themes associated with your Resources, Assets and Value. These will be the themes of your content. The number of themes you choose should be correlated to the number of days that you will be able to manage the Page per week. We’re almost there! Now assign a different theme for each day of the week, again based on the size of your team and time available. Then begin slotting in assets and value as inspiration for individual days going several weeks or even a couple of months into the future. Don’t go too far. This is your initial guide, but it should be fluid. That wasn’t all that hard, right? Now put all of this hard work into action. For the first few weeks, be as structured as possible. Make sure people have very clear roles and assignments. Who will be managing Facebook and at what times? Who will be responding to Fans? At what time will each piece of new content be written? Eventually, you should become less rigid, but it is important to establish some routine. That’s it! This is my approach when helping clients think through their Facebook content plan. How did you assemble yours?